An Activity represents a single screen with a user interface. They usually constitute one complete “action”, like signing up or updating a status or something like that. Intents trigger the next appropriate activity. So, for example, a clicking on the share button sends a Share Intent to the system that then pulls the appropriate share activity. Activities from different installed applications can be mixed and matched to allow the user to complete a task. In the case of “Share” for example, apps like Tweetdeck or Facebook add the appropriate Share Activities so that the user may pick the one that he actually cares about. The last point makes for very interesting scenarios. This means that app developers can relegate certain responsibilities to other apps the user may have installed. This is also what allows users to switch out the default apps with others. Prefer the new Firefox browser to the default Android one? Well, check off the box that always resolves the browser intent (or specifically the ACTION_VIEW intent) and now you’ll never see the native browser again. While the core Android intents are decently documented, there are even efforts on like OpenIntents.org that try to provide a central location for information on intents offered by third party applications. The video below by the folks at Remember the Milk showed how to add events to their app via Siri, but if the instructions are anything to go by, its a pretty smart hack but a hack nonetheless. Also I am not sure in this case if your tasks are being pushed to both RTM and Apple Reminders and if they are, I doubt the “done” action is synchronized as well. Compare that with the second video here done by me using Vlingo, an off the shelf Android personal assistant app (very similar to Siri and surprisingly decent). The video below triggers the “Share” intent at which point I can pick any app from my list of installed apps that respond to that intent. Note that I could have also checked the checkbox there to always go to Remember The Milk (actually my preferred todo app right now is Astrid) but its pretty cool to see that not only did the task successfully get added but so did the day (“Tomorrow”) which is a separate form element in the “Add Task” Activity. This kind of inter-app play makes for some very interesting possibilities. Its unfortunate that Apple seems to be going the exact opposite direction with apps on their platform. Apps on iOS are already pretty isolated from one another but now those rules are also going to be set on desktop software: a place where it makes even less sense. On the flip side there are also projects that want to extend the concept of intents to the entire web. If you haven’t seen it yet, check out WebIntents.org. I am pretty excited about this, hopefully this makes it. It looks like both Chrome and Firefox at least are looking to support that kind of mechanism for inter app communication. I first got really interested in inter app communications when I was playing around with Macromedia Central back in the day. 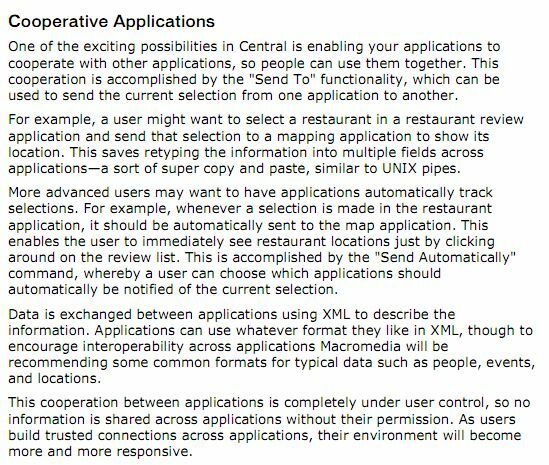 Central was Macromedia’s first try at Flash based desktop apps and never really made out of the developer preview, but it had some great ideas on inter-app communication. Hey Adobe, can we get this back in a future version of AIR? It would be hard unless it allow users to use predefine XML format that exchange data between apps just like SCORM.